​Darrell Troppy is a creative artist who specializes in the encaustic approach to creating artwork with the use of beeswax and other unique mediums. Some of Troppy’s collections have been showcased at The Art Connection Gallery in Palm Springs, CA and the KBR Tower in Houston, TX. In 2014, Troppy was invited to participate in the Carrousel Eastern and Western International Art Exhibit in Paris, France at The Louvre. Troppy was the only American artist selected to participate in the entire competition. He received a trophy award for “Most Creative Artist” and three certificates for “Outstanding Accomplishments” in various categories. HGTV is an American basic cable and satellite television channel that is owned by Scripps Networks Interactive. 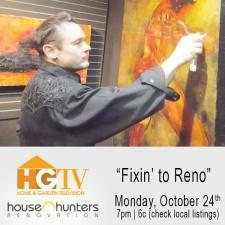 HGTV broadcasts a variety of how-to shows with a focus on home improvement, gardening, crafts, and remodeling. Award-Winning Artist Rachael Sage Releases Socially Conscious EP "The Tide"